Start taking classes at Game Changer Fitness and other studios! The gym is in the BACK of the building (by the 24 overpass). All GC Fitt classes are a full body workout and 1 hr long. Cardio and strength training are a prime focus but they also work on core, balance, agility, and overall fitness. Various equipment such as dumbbells, barbells, kettlebells, balls, ropes, boxes and more are used, as well as incorporating bodyweight and mobility exercises. Several timed formats will be used such as Tabata, HIIT, Circuit, EMOM, AMRAP & more. MixxFitt classes are great for beginners, people with injuries or limitations, new moms or those starting back after a hiatus. Focus is on strength-building, balance, agility and core exercises with moderate cardio movements. Tools include dumbbells, stability balls, resistance bands, TRX, bosus and more. The gym is located in the BACK of the big brick building (5427 Telegraph). Enter the property on 55th St. between Telegraph and Shattuck (closest to the intersection at Telegraph). Veer right to follow the building to the back. Please bring a water bottle and towel (if needed). GCF is a dog friendly gym. Those with allergies to dogs may have an adverse reaction. Check out the full website at www.gcfitclub.com or email if you have any questions! 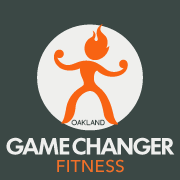 Game Changer Fitness is located at 5427 Telegraph Ave, at the corner of 55th and Telegraph in the Temescal neighborhood of Oakland. From Telegraph Ave., follow the parking lot entrance all the way to the back, past Mariposa Bakery, and around the left. They are in Unit W1 in THE BACK of the building, by the 24 overpass. If you are entering from 55th street, veer right to follow the building back toward the freeway and you'll see them! Ample free parking is available. This class is a really great class if you’re just getting into/ back into working out. I’m really impressed with how Jenn designs the workout so that it’s really approachable for everyone. I got back into working out with this class when I had been feeling really intimated to go to any class- now I take her 6 pm class, but went back to this one again today and felt so appreciative about how Jenn makes such a welcoming environment for everyone!!! Highly recommend !! Thank you! I strive to keep things different and challenging! Hope to see you again soon! Best gym!!! A great workout every time! Such a consistently powerful workout offered at GCF! Always options to tailor each session for where your body is that day, and always a welcoming atmosphere. There is something for everyone here!! This is a similar style to cross-fit, which I love but is not for everyone (especially newcomers or returners to fitness). The camaraderie and orderliness of the facility is great. High energy considering it was 6am. A good workout that pushes you. This was the first class I’ve taken (in general) so I was a little anxious. Some moves I wasn’t familiar with so i had to watch folks a few times to get it right. thank you!!! we hope you come back and see us soon! Really fun HIIT and Tabata style workout. Positive vibe and supportive.